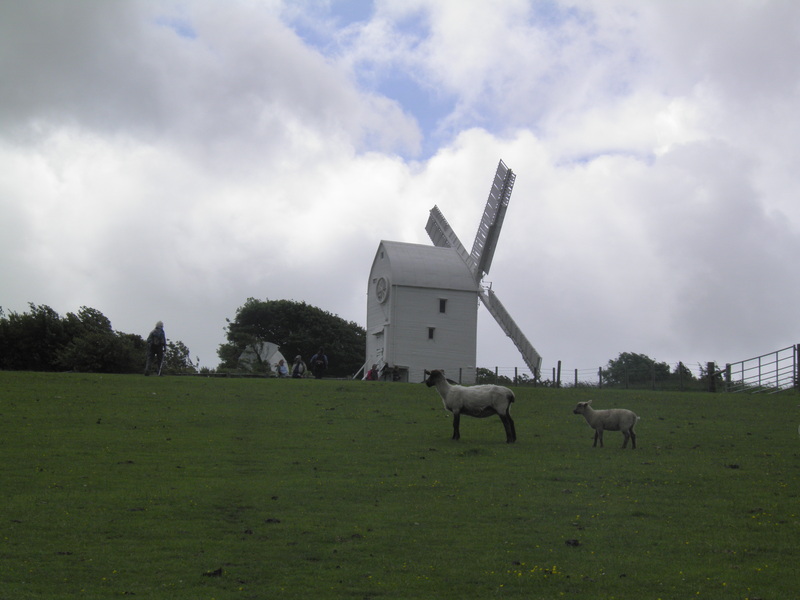 A classic walk along the sharp, windy northern escarpment of the South Downs, starting with a climb to Clayton’s famous windmills, then on to Ditchling Beacon’s fine views, before descending to the peaceful valley of the Ouse to end in historic Lewes. 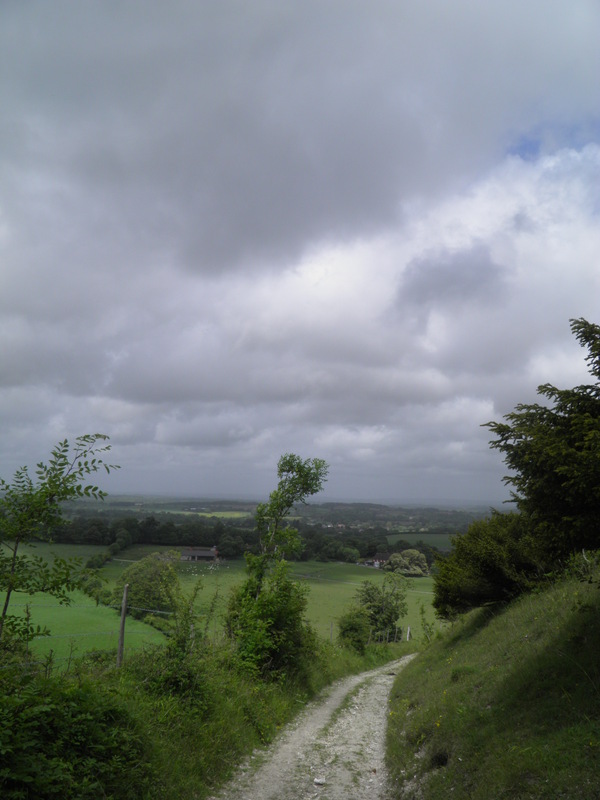 Underfoot: Being mainly over chalk downland, the surfaces you will encounter will vary a lot depending on recent weather – if there has been significant rain, there will be mud, especially on the bridleways popular with mountain bikers. At other times, your boots will only have dust on them. Terrain: One very steep climb out of Clayton. Once on the tops, the path is constantly climbing and falling, but always at very gentle gradients. There is one short section of steep descent into Offham. Maps: 1:50,000 Landranger 198 Brighton & Lewes; 1:25,000 Explorer 122 Brighton & Hove. 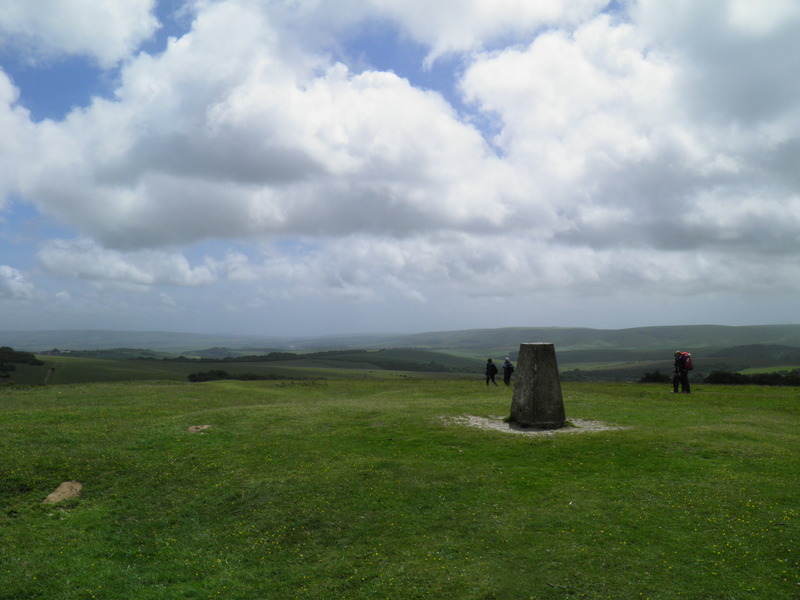 Useful websites: Much of the walk is along the South Downs Way. You pass the Jack & Jill Windmills and the National Trust land at Blackcap. 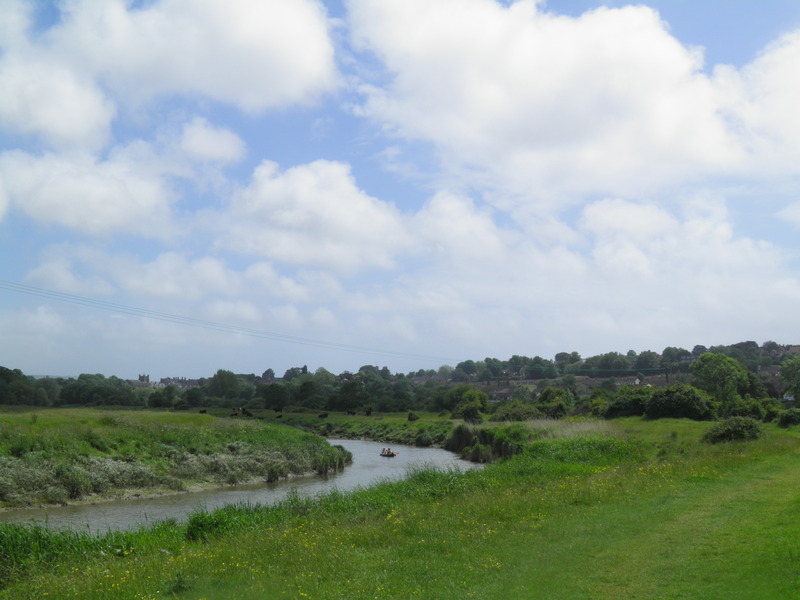 The walk ends near Lewes Castle. 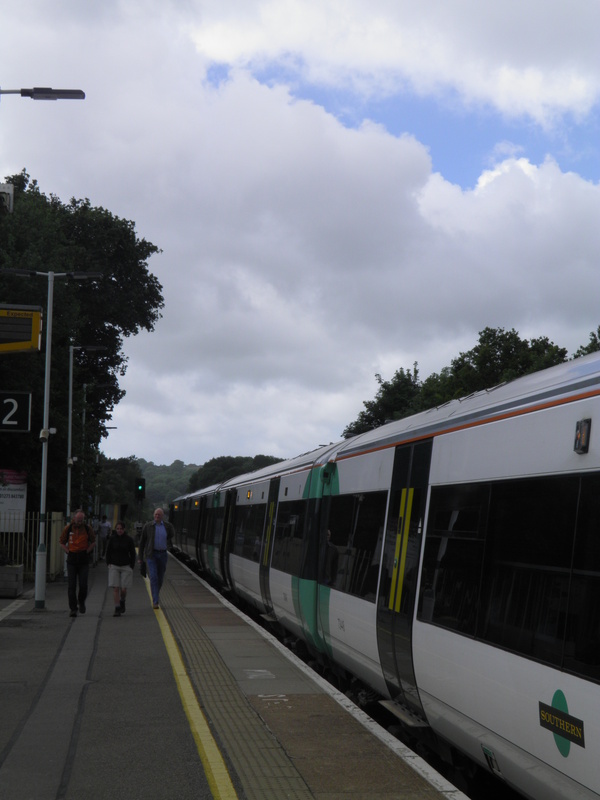 Getting there: Hassocks is situated on the London-Brighton mainline. It is served daily by 2 Thameslink services per hour from London St Pancras (72 mins) via Farringdon (67 mins), London Blackfriars (61 mins), London Bridge (54 mins) and East Croydon (41 mins). There is also an hourly Southern service from London Victoria (50 mins) via East Croydon (33 mins). Getting home: Lewes is served by a twice hourly (hourly on Sundays) Southern service to London Victoria (67 mins) via East Croydon (50 mins) for connections to London Bridge and London St Pancras and Clapham Junction (59 mins) for London Overground connections. Fares: As Hassocks and Lewes are on two seperate branches, if you purchase ordinary tickets you will need to buy two tickets. Purchase an off-peak return to Hassocks (ensuring it is a valid via any operator ticket) for £20.60 (child £10.30, railcard £13.60. If the train you are catching back from Lewes calls at Wivelsfield, buy a Lewes-Wivelsfield single for £5.20 (child £2.60, railcard £3.45), otherwise purchase a Lewes-Haywards Heath single for £6.30 (child £3.15, railcard £4.15). A potentially cheaper option is Southern’s Daysave ticket, which must be purchased online three days before travel. The Daysave ticket gives off peak travel on all Southern services for £15.00 (£2.00 for an accompanied child, no railcard discount). Using the Daysave does limit you to using the hourly Southern service from Victoria to reach Hassocks, but is valid on all trains back from Lewes. Arriving at Hassocks from the London direction, leave the platform into the car park. Opposite the Hassocks pub, follow the brown sign to ‘South Downs’ along an alley to a busy road. Keep ahead along the road and cross just before the railway bridge, taking the footpath up the steps opposite (not the lower path). 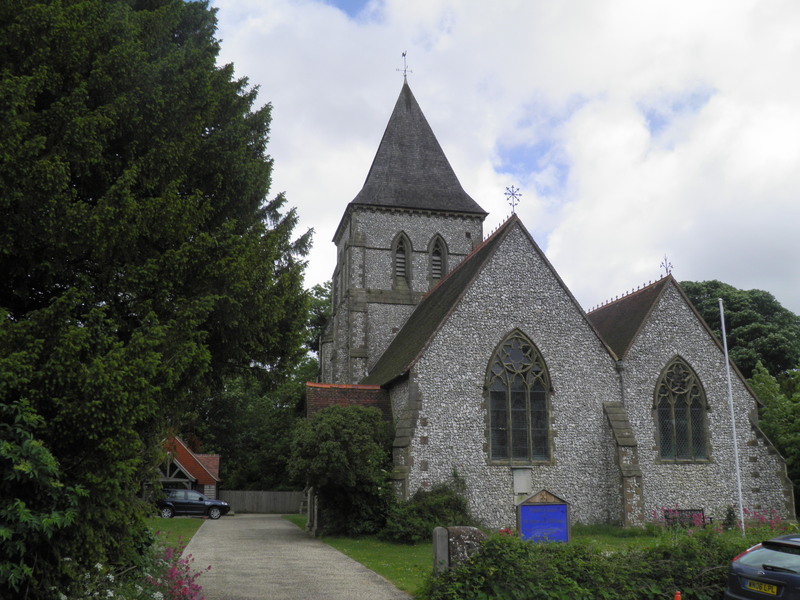 Hassocks is a town that owes its existence almost entirely to the railway, before whose construction in 1839, it was merely a collection of cottages and a coaching house between the older villages of Clayton and Keymer. Allegedly, the failure of these two parishes to agree on a name for the station led to the London & Brighton Railway adopting the original name of ‘Hassocks Gate’. 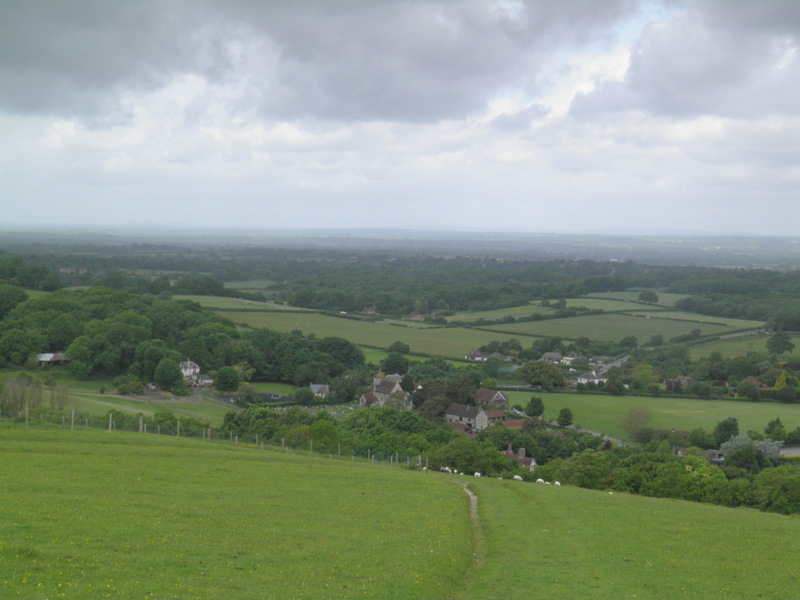 As well as leading to the rapid growth of the town – which now has a population of nearly 7,000 – the railway made the South Downs into a popular excursion destination for Londoners, with special trains frequently being run to Hassocks. 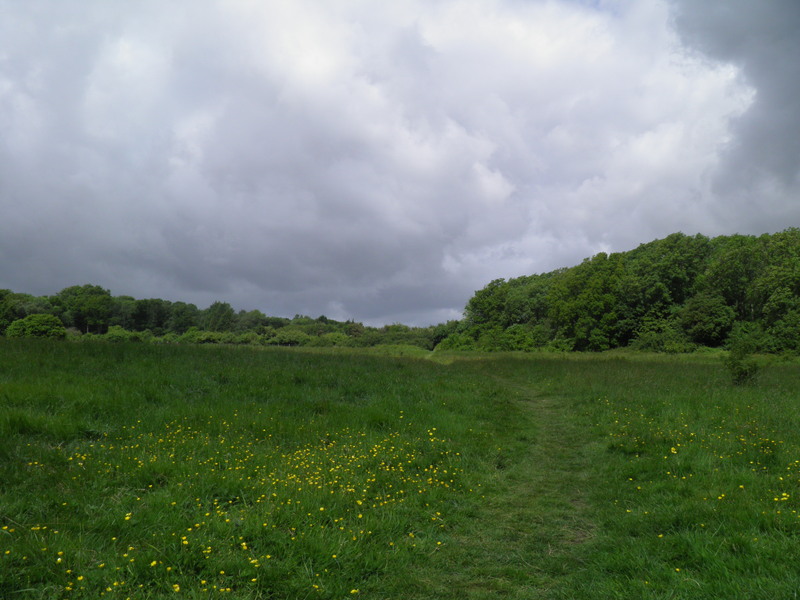 behind and walking beside Butcher’s Wood, a patch of ancient woodland now in the care of the Woodland Trust. Just after the second kissing gate into the wood, follow a footpath sign to the left , through a squeeze stile and into a meadow. Keep to the reasonably clear path cutting straight ahead across the grassland, towards another wood on the far side. Beside the wood, you join a broader path and keep left, dropping slightly before curving left to another squeeze stile onto a track . the ridge. Keep to the track past Halfway house to reach the B2112. Cross this fast road with care and take the bridleway signed opposite, passing a pleasant pond on the right. Climbing slightly, the route soon becomes a gravel and then tarmac drive curving through the houses of Clayton to reach a minor road by a fine half-timbered house. Head left, uphill. Pass a drive and shortly afterwards head right on a broad footpath, climbing sharply through trees then through a gate into more open downland. climbing up the grassland . Continue to climb on this path, which itself soon runs out. Continue uphill over the grass, heading towards the sails of ‘Jill’ windmill on the top of the ridge. afterwards, a brick tower mill with a rotating cap, in sharp contrast to Jill, an almost entirely wooden post mill. Both remained in use until 1906, after which they became private residences and holiday homes. Restoration work began on Jill in 1978, returning it to fully working order – though suffering something of a setback in 1987, when the Great Storm caused gusts of 120mph along the ridge, turning the sails in the wrong direction, leading to sparks being produced from the brake shoes, setting the building alight. Luckily, the blaze was brought swiftly under control and volunteer labour was able to restore the damage. Jill is open to the public on most Sundays, whilst Jack remains in private ownership, without its cap or sails. Do not head right into the windmill car park, but keep ahead through a footgate on a fenced bridleway (signed ‘To South Downs Way’), passing the stump of ‘Jack’. Swinging right, the path soon reaches a tarmac track. Follow the bridleway waymarks left, keeping left where the track forks  (marked as the South Downs Way – SDW – to Ditching Beacon). As you climb, views open up southwards to Brighton and the Channel. 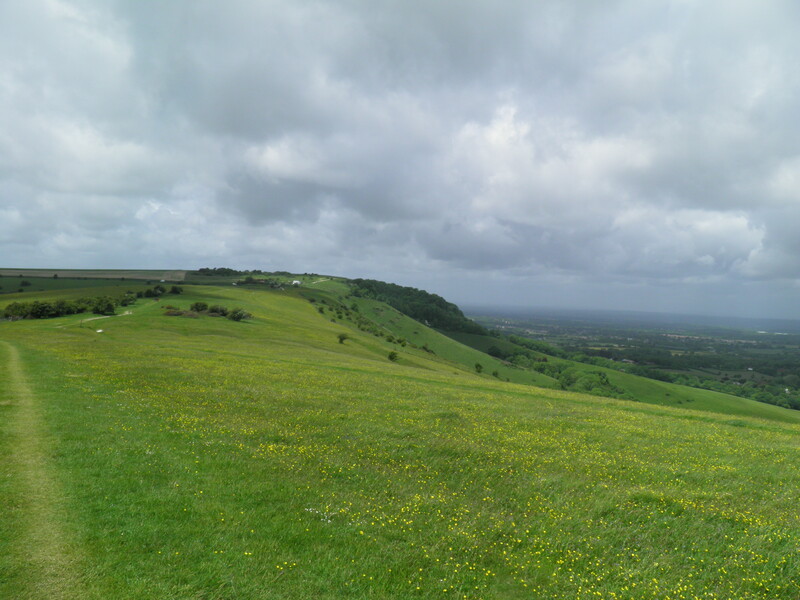 The South Downs, whose northern escarpment you are now walking along, are a range of chalk hills stretching almost a hundred miles along the south coast. 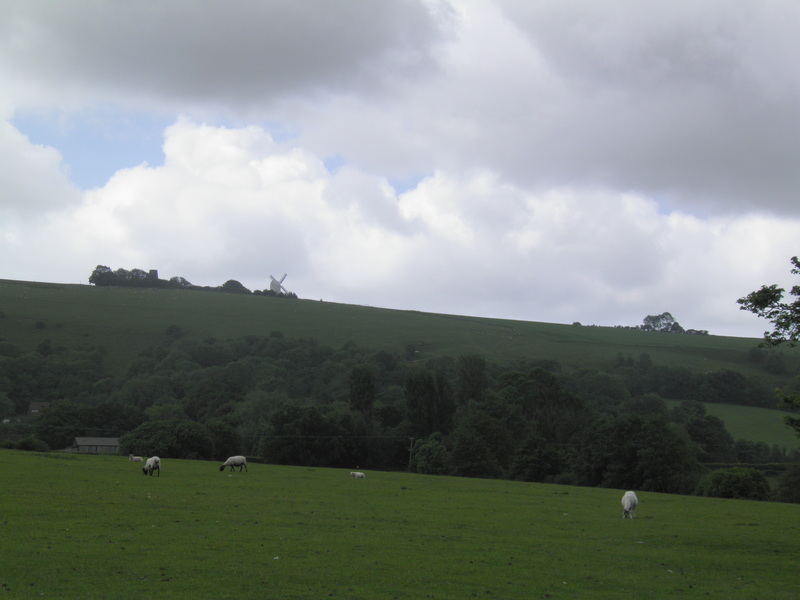 Originally, these hills would have been dominated by lightly grazed chalk downland and whilst you will pass plenty of this along the way, this ecosystem now accounts for just 3% of the area of the Downs – in particular, cultivation for domestic food production during World War 2 saw significant loss. 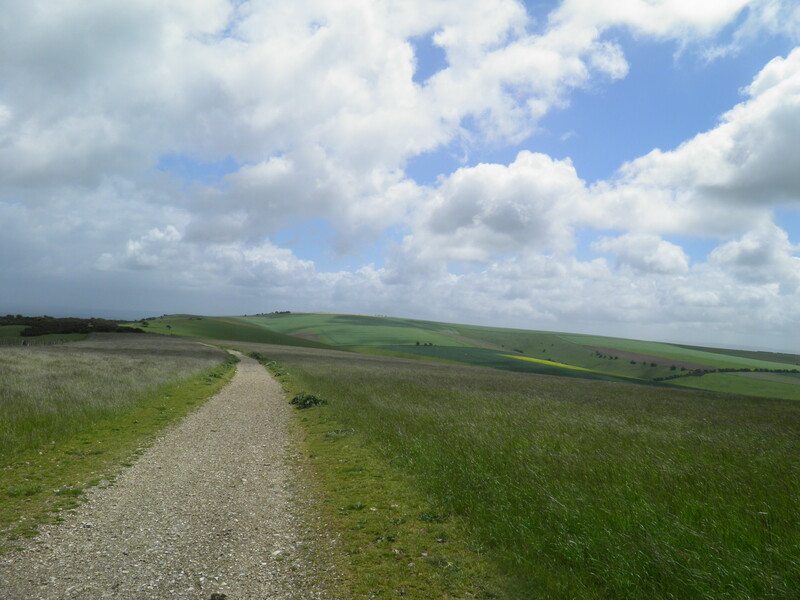 The South Downs Way, on which you are walking, runs the length of the Downs from Winchester to Eastbourne, where the famous cliffs at Beachy Head mark the eastern end of the hills. 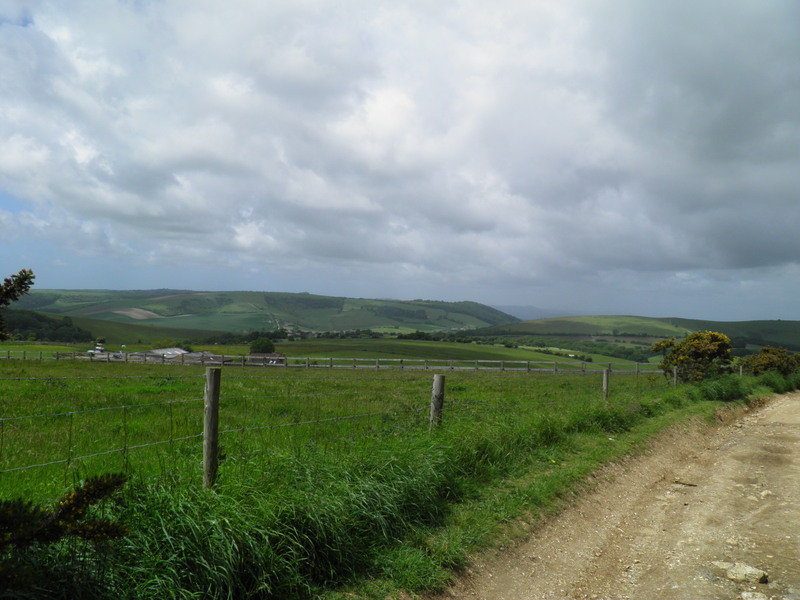 In 2011, the South Downs became Britain’s newest national park. 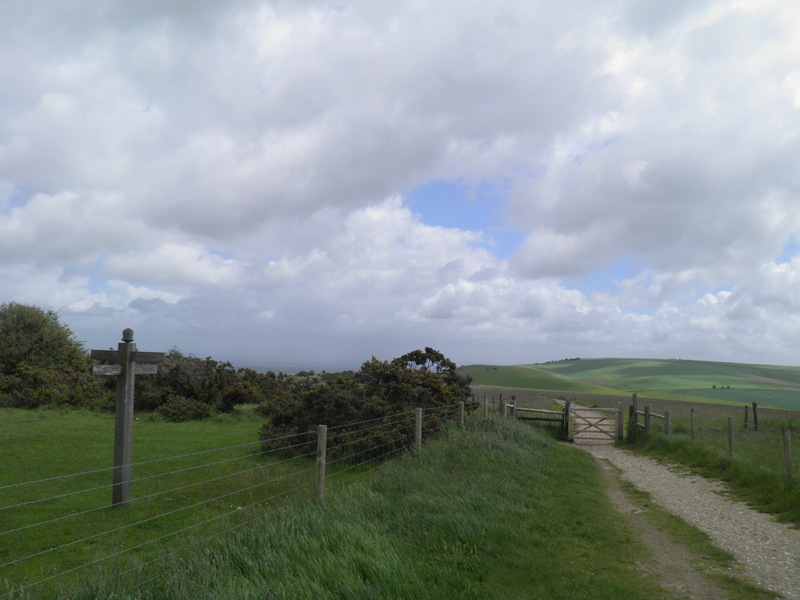 ahead through a footgate and onto a very clear hilltop path heading for the heights of Ditchling Beacon. Pass through another footgate next to gorse lined Burnt House Pond. Past one more round pond and another footgate and you begin the climb to the summit of Ditchling Beacon – the trig point is just off to the right of the path. Descend to the car park and road, views opening to the right to the slightly incongruous Brighton & Hove Albion stadium nestling in the Downs at Falmer. Cross the road with care at this blind corner and continue ahead on the SDW. Continue on the clear path over Western Brow  and Streat Hill, after which you descend to a tarmac track . Cross and continue straight on the SDW. At a track fork above the large buildings of Plumpton Agricultural College keep ahead on the ridgetop track, climbing gently again to Plumpton Plain. you keep to the left hand route, climbing gently beside trees to reach the trig point at Blackcap. Descending, the path almost immediately forks. Take the LH path heading for the beacon on Mount Harry ahead. Continue on this clear path, over the saddle and then climbing again to pass just to the left of the beacon. Eventually reaching a corner of the fence by a waymarked junction of bridleways , veer left on the clear path dropping into the wood. The path soon levels off, passes through a footgate and a second footgate brings you onto a wider bridleway . Head left, dropping steeply towards the houses of Offham. You emerge in the village on the A275. Turn left along the pavement and opposite a flint knapped lodge house by the drive to Offham House, cross and take The Drove (signed to Hamsey) opposite – the Blacksmiths Arms is a couple of metres straight ahead on the main road. swings downhill, passing a pylon. The track runs through the woods, gradually edging closer to valley floor level. About 500m beyond the pylon, keep an eye open for a gate on the left and pass through the kissing gate beside it (footpath waymark)  into the grassy valley floor. 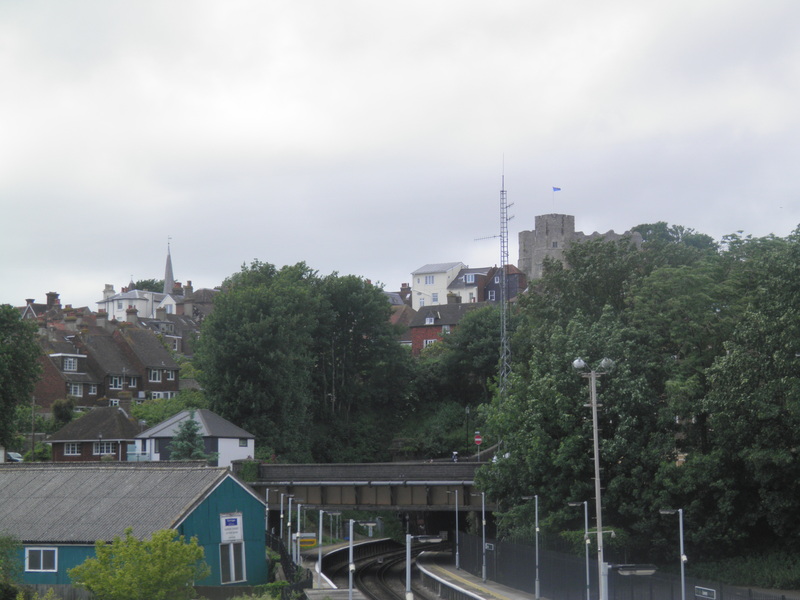 views of Hamsey church to the left and Lewes Castle to the right. Head right along the levee through a pair of footgates. For the next kilometre or so you wander along the lovely reedy banks of the tidal river, passing South Malling church almost hidden among the trees on the far bank. Eventually, you reach a footbridge over the Ouse . Do not cross the bridge, but instead turn right along the tarmac footpath away from the river. This soon leads you alongside an artificial lake and out onto a road. Take St Johns Hill climbing straight ahead, keeping straight on where it becomes St Johns Terrace. On reaching the main road by the Elephant & Castle pub, cross at the zebra crossing and turn left. 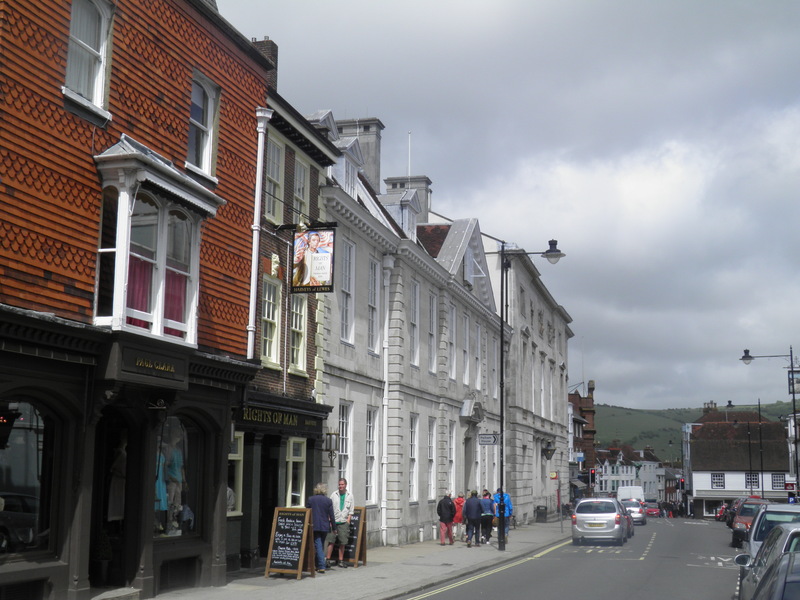 Swing round to the right on Fisher Street , crossing where the pavement runs out to reach Lewes’ main street. It is definitely worth turning right to explore the town. However, if you want to head straight to the station continue straight ahead at the traffic lights to descend Station Street, keeping straight on again by the Lansdown Arms to reach the main station entrance.